The Design + family includes modern cooker hoods for all tastes. From the simplest to the most complex and intricate, from the most minimalist to the boldest, from standard cooker hoods to the most unique and sought after. The Design + family really contains many products, all of which are characterised by the use of the best materials, the best manufacturing technologies and technical solutions, and our customary attention and care in manufacturing. The false ceiling must support the weight of the hood (35 kg without motor). 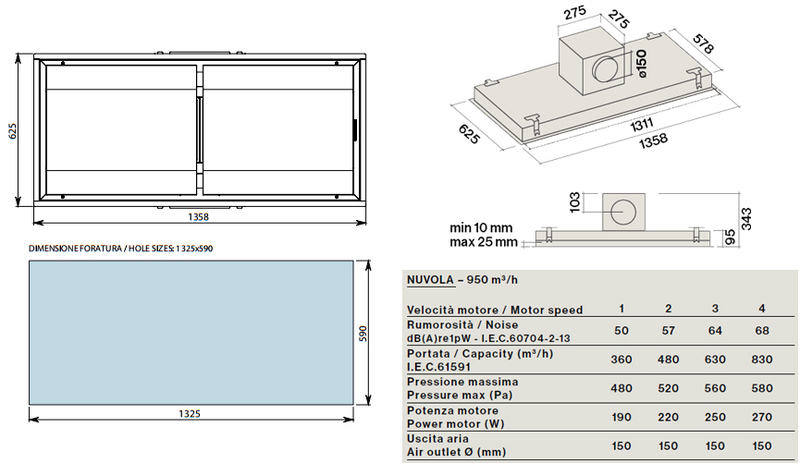 Nuvola is supplied with motors which can be installed on the upper part of the product or in a remote position.